Certainly true for my area of NE Lower Michigan. Blows Verizon right out of the water. Your results may vary. 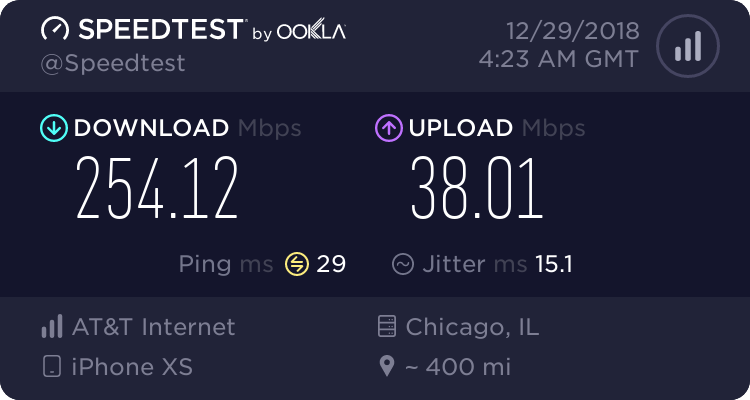 Network performance differs per user location. Just days after another crowd sourced app (OpenSignal) reported this using only (5GE) 4GLTE devices: https://arstechnica.com/information-...g-study-finds/ Just messing with ya. Anyways congrats to AT&T and all those who made this report possible. In Sacramento at least, AT&T used to be great, then they let the network rot for about 8-9 years, then about a year ago I don’t know what got into them, but they got busy again, adding macros, small cells, and all kinds of tower work. Now they’re freaking awesome here, while t-mobile and Verizon seem to choke down anywhere people congregate, AT&T runs smooth as silk now. They have a habit of doing that in some areas. Maybe they see what Verizon has accomplished maximizing their network? Or is most of it due to the FirstNet Band 14 additions? Any new upgrades spotted in NYC Metro for AT&T as of late? I haven’t been able to confirm any work has been specifically related to them. All I know is there is more work going on now to add coverage and capacity than I have ever seen before. Far more, in fact. The results are beginning to show. Yes, I've spotted LAA and small cells in Brooklyn, and macros that have the high traffic panels. They look over a foot wide. (4 per sector) Couldn't grab a pic though. Running every band but LAA. Have you been seeing new coverage, or density in weak areas? Both? Hopefully this trend will continue. I must say that even sites running 12 and 2 are still performing very well here. I'm looking forward to what I find on my next trip upstate. There's a few areas that need coverage, I'd like to see some colocation with Verizon and vice versa. Definitely. Pool their investment so both can benefit. New media campaign set to launch "Rogers is the clearest wireless network in canada"
Who has the best wireless network in CT?....The one that can PROVE IT!